With the advent of digitised technology, computers and the internet are changing our sense of world, place, space and experience. Many of us spend more and more time translating our thoughts and emotions into 0's and 1's, becoming one with the 'machine' and in effect, turning into cyborgs. Cyborg : a compound word derived from cybernetics and organism, is a term coined by Manfred Clynes in 1960 to describe the need for mankind to artificially enhance biological functions in order to survive in the hostile environment of Space. Originally, a cyborg referred to a human being with bodily functions aided or controlled by technological devices, such as an oxygen tank, artificial heart valve or insulin pump. Over the years, the term has acquired a more general meaning, describing the dependence of human beings on technology. In this sense, cyborg can be used to characterise anyone who relies on a computer to complete their daily work. In a web article entitled Cyberfeminism with a Difference, Rosi Braidotti discusses how, through technology, we exist in more than one place and time through duplication, publication and transmission. Referred to as the 'tyranny of gaze', the triumph of vision discriminates against touch and sound and reinstates the hierarchy of bodily perception. Infotechnology brings about passionate detachment and desensitises our sense of ethics, spirituality and individuality. Jenny Holzer is an artist who uses the medium of word and technology to address public opinion through what she calls 'agitprop' (agitation propaganda). She stimulates debate and contemplation in order to bring about a paradigm shift, transmitting her capitalised words through any medium technology has on offer, including the internet. One of her famous works exclaims: 'PROTECT ME FROM WHAT I WANT'. Linda Dement is a cyberfeminist and digital artist. In her CD-Rom interactive work, Cyberflesh Monster, she recombines fleshy representations of the female body recorded with a scanner at a lesbian bar. "I believe there is great value, knowledge and beauty in the darker side of life; in madness, wounds, emotions, memories, scars and pain. ... The imagery that comes up for me is full of difficulty: conflict, blood and guts." The question posed was simple: what would happen if I were to engage in a 'dialogue' with the internet? As an individual I come with a framework of world experience. I act as filter of the stimuli and information received from my environment. This act of processing, through choice, decision and reaction, continuously moulds my sense of self and my subsequent attitude towards my environment. Identify 'I' : born foreign, grew up in South Africa, female, lesbian, women, white, pro co-operation, anti-hierarchy, existential. Based on this sense of self, I selected specific words to act as question: anger, crazy, anxious, depressed, desperate, existential, exuberant, eyes, feminist, frustrated, happy, hope, hungry, judgmental, nothing, sensual and sympathy. Using Google.com as mediator, I instructed the search engine to collect off the internet any image it had access to that made reference to these words. The images were harvested regardless of their content (Google's filter) and re-contextualised (my filter) into an interactive art work. The result is a dialogue between artist and internet. There is something singularly depressing and exhilarating about sitting down behind a computer and climbing onto the internet. On the one hand there is the excitement of exploration and discovery, on the other an incredible feeling of loss and estrangement. We take our emotions, dreams, hopes, fears and beliefs, everything that makes us human, onto the internet - a network of digital coding. The act is totally random - click here, link there, read this, image there. The route is unpredictable, ending up in discovery or disappointment. The connection is fleeting, once the link is severed - the contact is lost. This work explores the notion of approaching a search engine and 'asking' it to find me images representative of certain emotions and issues. Google (a popular search engine) becomes the character with whom I'm having a conversation - it's choices are based on a simple principle: if the word somehow references an image, it will show me that image. 'This is not relevant' is a decision it cannot make. This work is the result of that 'conversation', harvesting those images off the web and re-constructing them into a work that experiments with the results that Google had on offer. Talk to Me proved to be an interesting experiment, but quite depressing to execute. In Xplor I decided to take charge, rather than be left at the mercy of Google. I altered my thinking in that Google now became the access point to my palette (images), and the applications my brush (image manipulation). Still playing the word-image game, I explored the notion of space. 'Drive', 'Jump', 'Mind/Soul/Body/Spirit' are three explorations which represent random and accidental journeys. This time words were specifically selected in order to 'paint' a narrative. Only those images which appealed to my purpose were harvested. 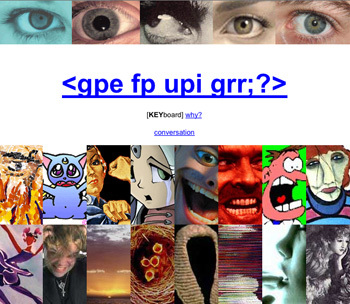 A Conversation with Google was part of a fourth year visual arts project presented at the UNISA Art Gallery towards the end of 2003. At the time the conversation was pariticulary depressing and dull due to the heavy textual/factual nature of the internet, and my limited understanding of web media. A similar project in 2011 would yield a completely different result. A vastly more sophisticated version of this project made it's way onto the internet in 2005 called 'we feel fine' [.org] by Jonathen Harris and Sep Kamvar. This interactive work harvests information off the great internet database, particularly focusing on social media spaces such as blogging environments. Jonathen Harris did a wonderful presentation at TED.com on the project.